MDLIVE’s technology and online strategies deliver a comprehensive, end-to-end virtual care solution that will enable your organization to create a holistic digital front-door strategy. Your health care system can reduce costs, accelerate revenue and increase access while removing the barriers between patients and the ongoing care you deliver – when and where they need it. MDLIVE’s secure platforms ensure that your patients will have immediate, convenient access to one of the nation’s largest network of telehealth providers via voice, video and mobile devices. We offer a complimentary virtual care assessment. MDLIVE works with your health system to develop virtual care solutions and strategies that address your community’s unique healthcare challenges. We will guide your organization with a comprehensive, customized telehealth experience that reduces operating costs while improving provider efficiency and quality. We start by providing secure, HIPAA-compliant platforms and interfaces that provide intuitive, easy-to-use patient and provider experiences that improve care coordination, provider load balance and access to care throughout your community. Then we dive deeper, helping you identify, train and deploy your team of telehealth providers. By combining our expert industry knowledge and the ever-evolving power of artificial intelligence, we help ensure continuous patient engagement and utilization. The end result is a healthier community with better coordinated care and a stronger connection to your brand. Build on the trust you’ve earned in your community. 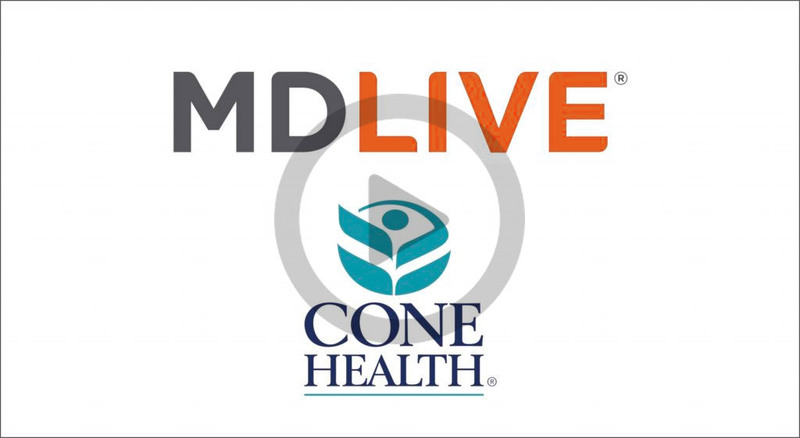 Find out how MDLIVE helped Cone Health expand access to low-acuity care for more than 16,000 Virginians and North Carolinians and save as much as $500,000 in urgent care and ER visits in 2018. Only MDLIVE offers a virtual health assistant, designed to improve engagement and enhance the member experience. Meet Sophie right now by texting ‘DOCTOR’ to 635483 (MDLIVE) on your mobile device!